Hi everyone! I hope you’re all doing well. Big plans for this weekend? I’ll be busy swatching and creating nail art for mine. I’ve missed my little blog but I’m happy to say that I’m finally done with this semester of school (my exams being the reason of my recent absence) and I’m back with lots of swatches and nail art planned for the next two weeks. I’ll start with the nail art that I created it with piCture pOlish Fairy Floss before my exam week started that I didn’t have a chance to post. There’s also a step by step tutorial for you. Fairy Floss is a soft light pink. 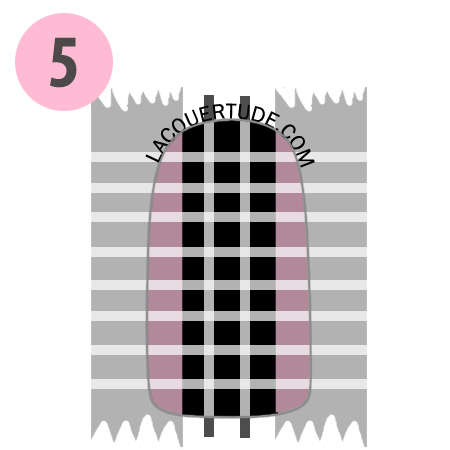 I can see myself wear this a lot on its own and as part of nail art desigs or undie for glitters. Formula is perfect like all of my piCture pOlish so far, smooth and opaque in 2 coats. 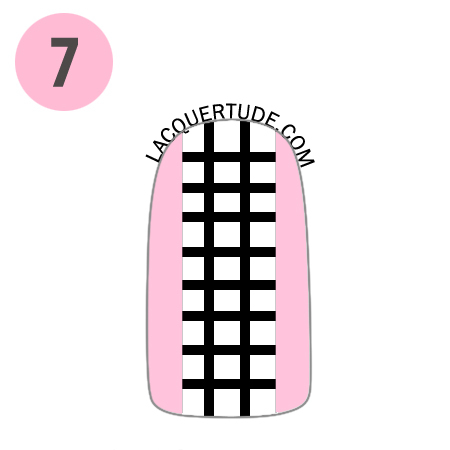 For the nail art, you will need to pre-cut striping tape and scotch tape for the black grid design. 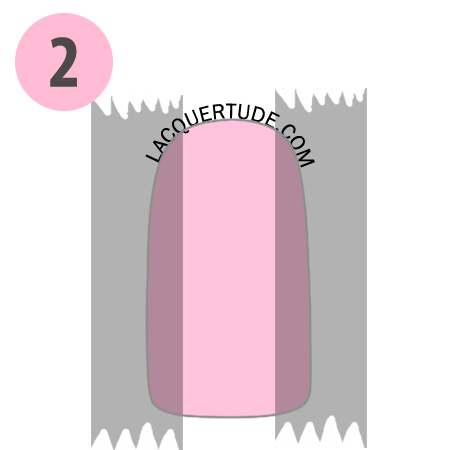 Paint 2 coats of Fairy Floss and let dry (or apply a thin layer of quick dry topcoat). Use scotch tape to block off the sides, leaving the center panel open. Fill the open area with black polish. 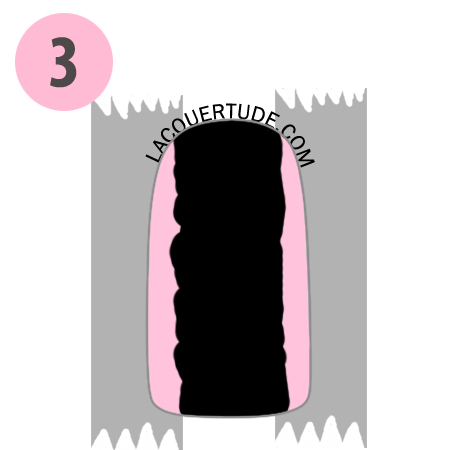 Immediately remove the tape to reveal the perfect straight black block in the middle. Let dry completely. Use scotch tape to mask off the same side panels as you did in step 2 (this is to protect your perfectly straight black edges). Then use pre-cut striping tape to mask off an even grid. 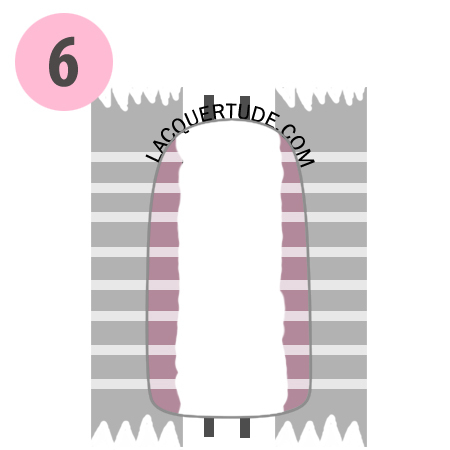 Take care to place each tape straight so that they form little square shapes. TIP: remember the order with which you placed the tape so you can remove them in reverse order. Fill the open area with an opaque white polish. Immediately peel off all the tape: striping tape first (in reverse order from when you placed them down), then the scotch tape. TIP: use tweezers for better handling. The half moon design is really simple. I used half of binder enforcer stickers to create the standard half moon (more pictures in my owl tutorial here) with white and pink and outlined it with black polish. Hope you enjoyed this tutorial. Leave your questions in the comments below and I will answer them! If you recreate this look, I would love to see your hard work. 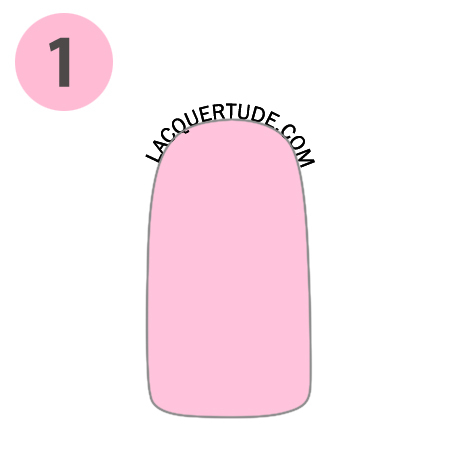 Share your photo by hashtagging #lacquertude on Instagram, or post it on my Facebook wall here. Thank you so much for reading and have a wonderful weekend ♥!